Inventory We are a resale marketplace, not a box office or venue. Ticket prices may exceed face value. This site is not owned by Saroyan Theater . 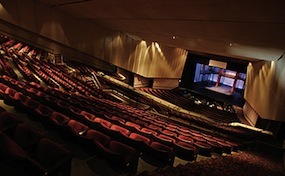 The Saroyan Theater is named after native Fresnan, novelist William Saroyan the 2,353 seat theatre is home the Fresno Philharmonic and the Fresno Ballet. Thomas Griswold conducted the inaugural concert in this new theatre on October 14, 1966. The theatre has hosted Mikhail Baryshnikov, Arthur Fiedler, George Carlin, Jerry Seinfeld, and Isaac Stern as well as magician David Copperfield, Broadway shows Cats, The Sound of Music, Evita, Chicago, and Riverdance and the Miss California Pageant. In 2011 the Saroyan Theatre wull feature a short run of Wicked the Musical. Saroyan.TheatreFresno.com is not affiliated with any primary box office or supplier. We are a privately owned and operated business specializing in sales in the secondary market. To buy tickets for any Saroyan Theater events in Fresno simply click on the event of interest or call our operators at anytime.